There is something terribly mythic about journeys down rivers. A trip downriver takes us out of our quotidian life. It strips away the defenses of home, and of terra firma. Combine a journey downriver in the Amazonian jungle and the clash of indigenous peoples with “civilization,” and you’ve got the essential tragedy of the world. Embrace of the Serpent starts with a view from behind of a man with a powerful physique, standing on a riverbank somewhere in the Amazon Basin, looking with deep suspicion onto the river. Which river, of the thousands in that vast region, we don’t know. The man wears no machine-manufactured clothing. A dugout canoe glides into view. It carries two men, both wearing machine-manufactured clothing, one an indigenous person of the Amazon, Manduca (Yauenkü Miguee), the other a wiry bearded older European, Theo (Jan Bijvoet). The man on the riverbank, Karamakate (Nilbio Torres), raises his blow gun and threatens to kill them. Manduca, the guide, yells in Karamakate’s native language not to kill them. Karamakate relents. We learn that Karamakate believes that he is the last of his people, the Cohiuano people, his tribe having been massacred by rubber barons. Theo tells Karamakate that there are still a few of his people alive, and he will take them there, if Karamakate also helps him find the yakruna plant, a rare plant with reputed healing powers. Karamakate doesn’t believe Theo, but his longing to be reunited overpowers his disbelief. The other, parallel, storyline in this compelling film starts in the same location, forty years later. This time there is just one white person, Evan (Brionne Davis), an American, in the dugout canoe, and a much older Karamakate (Antonio Bolívar Salvado) on the riverbank, aged but still still powerful, and still not clad in machine-made garments. Anger and survivor’s guilt haunt Karamakate’s eyes. Evan, like Theo before him, is seeking the Yakruna plant. Columbian director Ciro Guerra based Embrace of the Serpent (El Embrazo de la serpiente) on the travel journals of Theodor Koch-Grünberg (Theo), a German biologist, and of Richard Evan Schultes (Evan), a Harvard professor generally regarded as the founder of ethnobiology. Koch-Grünberg was taking an extended holiday from the University of Tübingen in the days before World War I. Schultes, the first scientist to describe ayahuasca, went on many expeditions to the Amazon, expeditions which involved both solid science and a fair amount of “sampling.” Among other works, Schultes was co-author, with Albert Hofmann, of The Plants of the Gods: Their Sacred, Healing and Hallucinogenic Powers. Karamakate’s experience with whites has understandably embittered him. He curses Manduca for wearing manufactured clothing. His world is an ancient one, with rules thousands of years old to govern every aspect of survival in one of the richest and most inhospitable environments on the planet. Karamakate is a complex individual, capable of profound understanding, mercy, and unsparing violence when it is needed to survive. This is the wisdom of pre-agricultural peoples. Embrace of the Serpent is difficult to watch. But the film doesn’t try to fill us with outrage or force a judgment. The movie avoids the techniques that pull heartstrings. There are few close-ups. The jungle, our characters, their journeys, are shown from a certain remove. The film was shot in black and white, a choice which adds to the distancing effect. The stark cinematography emphasizes the power and magnificence of the jungle. The viewer is involved, certainly, but there is a sense of detachment. This detachment is fundamental to the achievement of the film. Embrace of the Serpent does not ask us to judge. It invites us to accept. Acceptance is tough, because it makes us look at ourselves. The difficulties of filming in the Amazon are well known. Werner Herzog’s My Best Fiend made that clear. 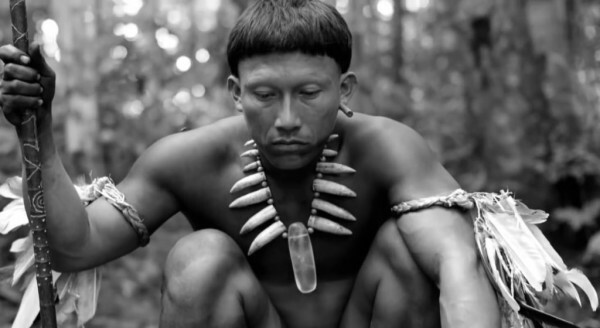 For Embrace of the Serpent, Guerra first consulted a shaman, who spent the night alone in the jungle and “explained the project to the forest,” in the director’s words. And there is the linguistic diversity of the Amazon Basin, which mirrors the biological diversity. Nine indigenous Amazonian languages are heard in Embrace of the Serpent, as well as Spanish, German, and even a little English. And the Yakruna plant? It turns up a couple of times, in different contexts. It appears to heal in more ways than one. Me, I love the modern world. It offers comforts and possibilities inconceivable in even the recent past. But we have lost a visceral personal connection to nature. I feel that loss every time I stop and look at a tree. Then I go home to my apartment. Wearing machine-made clothes. And sleep in a warm, comfortable bed. Embrace of the Serpent is Colombia’s entry in the Academy Awards for best foreign-language film. The very existence of such an award can be seen as a relic of colonialism. Embrace of the Serpent, directed by Ciro Guerra. With Nilbio Torres, Yauenkü Miguee, Antonio Bolívar Salvado, Jan Bijvoet, and Brionne Davis. At Film Forum (www.filmforum.org) through Tuesday, March 1. Note: HELD OVER till at least March 15.